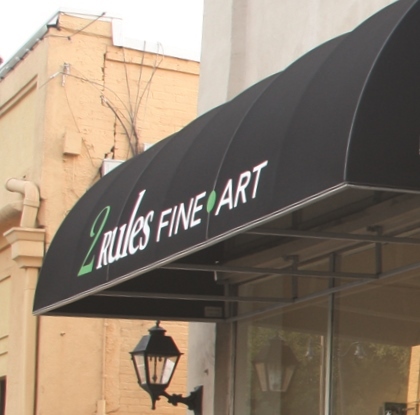 2 Rules Fine Art LLC is a commercial art gallery privately owned and operated by Helen Rule and Dennis Dejarme. Founded in 2011, the gallery presents group exhibitions of fine art by local and national artists, with an emphasis on art that is innovative in technique, presentation or design. In addition to changing exhibitions, the gallery always has a diverse collection of handcrafted artworks available for purchase. These works range from exquisite to downright quirky, so you’re sure to find something special. Choose from the area’s largest selection of hand-thrown and hand-built pottery by local artists, as well as unique chainmaille jewelry designed and created by owner Helen Rule. Works by other select gallery artists include paintings, prints, mixed media art, glass art, turned wood, ceramic sculptures, giclée prints, limited edition prints and letterpress cards. Adding to the fun atmosphere is Sparky, the gallery’s live electric eel, who entertains gallery guests of all ages. The gallery is located on Church Street in Marietta’s historic district just steps off the Marietta Square. We are proud to be a part of Marietta’s arts culture. In addition to being the gallery administrator and owner, Helen is a chainmaille artist. Her jewelry and armor designs reflect her extensive background in cultural anthropology and archaeology, as well as her experiences in China and Europe and her passion for East Asian art and military history. Helen holds a degree in anthropology from Johns Hopkins University and an MBA from Emory University. Co-administrator of the gallery and IT guy, Dennis runs the gallery with Helen focusing his energies on more behind the scene activities like managing the website, social media, and email newsletters. Dennis holds a degree in Business Administration and Computer Science from Oglethorpe University.